The information in this monitoring program was used to form recommendations contained in the July 2013 Biennial Master Plan Monitoring Report (read report) for the ongoing implementation of the GSSC Master Plan. The report also includes recommendations for the implementation of the White Flint and Shady Grove Sector Plans. The Great Seneca Science Corridor Master Plan creates a vision of growth for the county’s largest concentration of technology companies. The plan describes a live-work community that fosters bioscience innovations within an attractive, sustainable mixed-use neighborhood. To achieve the plan’s vision, development must be centered around the Corridor Cities Transitway (CCT), a public transit line running from the Shady Grove Metro Station to Clarksburg. The plan’s staging requirements are intended to ensure that development of the Life Sciences Center is coordinated with the building of the necessary infrastructure and an adequate transportation system. Learn more in the Great Seneca Science Corridor Implementation Guidelines (500 kb). All Stage 1 requirements have been met. All available commercial capacity available in Stage 1 has been allocated; therefore Stage 1 is currently closed for new commercial development applications. Stage 1 remains open to residential development applications. Commercial development applications will still be accepted for developments with previously approved density (i.e. “pipeline” capacity). To ensure that staging is properly timed and adequate infrastructure is being provided, the GSSC Plan requires the creation of a biennial monitoring program to track development and staging triggers at each stage of the plan. An Implementation Advisory Committee comprising property owners, residents, and other stakeholders will monitor development plans, staging, and the County Capital Improvements Program, and will report to the Planning Board and County Council. The plan’s staging requirements allow an additional 400,000 square feet of commercial development and 2,500 new dwelling units in Stage 1. Health Care services are not applied to the capacity of Stage 1. Stage 2 allows for an additional 2.3 million square feet of commercial development and 2,000 new dwelling units. Health Care services are applied to the capacity of Stage 2. Stage 3 allows for an additional 2.3 million square feet of commercial development and 1,200 new dwelling units. Stage 4 allows for an additional 1.8 million square feet of commercial development and no new dwelling units. The owner of a property approved for commercial development may re-subdivide and convert to residential development. This conversion will be exempt from staging, as long as the change does not increase vehicle trips. Planners apply two tests to assess transportation adequacy in the Life Sciences Center. Transportation tests balance the number of trips against the transportation infrastructure – transit, roads and pedestrian/cycling routes. Transportation Policy Area Review (TPAR) analyzes roadway and transit adequacy in each of the county’s 30 policy areas. TPAR establishes standards for roadway and transit adequacy and determines which policy areas meet those standards. TPAR was first approved by the County Council as part of the 2012 Subdivision Staging Policy. TPAR roadway analysis uses a regional travel demand model to assess the adequacy of main roads in the peak direction during the afternoon rush hour. Results are expressed for each of the major roadways as a Level of Service (LOS) from A to F, with LOS A representing free-flowing traffic, and LOS F representing gridlock. Transportation planners and engineers consider traffic operating in LOS D conditions during PM peak optimal for an efficient road network and good use of resources in a suburban area. TPAR is intended to assess overall level of service conditions for all main roads in a policy area, not to achieve adequacy for each individual road. However, this tool can be used to identify adequacy deficiencies along individual roadways and help prioritize where selected improvements may be considered. The TPAR assessment for the Research and Development Village Policy Area for the year 2022 projects adequate overall roadway adequacy. Assessment of each of the individual major roadways analyzed, however, shows the Sam Eig Highway is projected to exceed the acceptable LOS at times during the PM peak hour. Inadequate level of service traffic conditions also are projected for Sam Eig Highway for shorter term (year 2018) and longer term (year 2040) planning horizons if no improvements are made beyond the current Capital Program. All three metrics must meet the established standards for a policy area to be considered adequate for transit. Service Coverage measures the percentage of the policy area that lies within one-third of a mile of transit services such as bus routes. Seventy-five percent of the Research and Development Village Policy Area is within one-third of a mile of existing bus routes. The standard for suburban policy areas is 30 percent; therefore coverage is considered adequate in the Research and Development Village Policy Area. 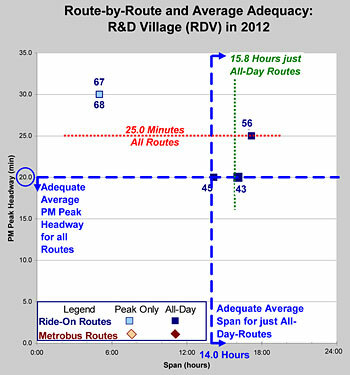 Analysis of Peak Headways measures the average time between arrival of transit vehicles at a stop during PM peak hours. The Peak Headway standard for the Research and Development Village Policy Area is 20 minutes or less. Current TPAR tests show the headway for the policy area to be 25.8 minutes during PM peak hours; therefore peak headways are considered not adequate. A proposal for a countywide initiative to add more buses to selected routes could bring peak headways up to acceptable levels in the policy area within the next 10 years. Because the peak headways for transit are not adequate for the Research and Development Village Policy Area, new developments are required to mitigate traffic associated with their construction by paying 25 percent of the development’s total impact fees. Span of Service looks at the transit system’s hours of operation. The standard for a suburban area is 14 hours of operation. The Span of Service for transit in the Research and Development Village policy area is 15.8 hours; therefore the Span of Service is adequate. Local Area Transportation Review (LATR) determines traffic levels at intersections within the Life Science Center. Intersection congestion is measured using Critical Lane Volume (CLV), which measures the number of vehicles that can move through an intersection’s conflicting lanes in an hour. LATR requires new developments and redevelopments that generate more than 30 new peak hour trips to analyze the adequacy of significant intersections in the vicinity of the development. 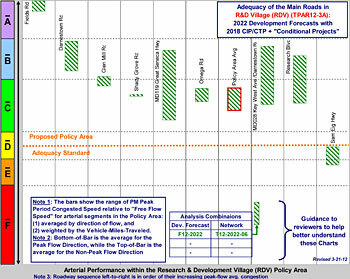 Intersection performance is measured by assessing the existing and projected CLV against a standard of 1,450. 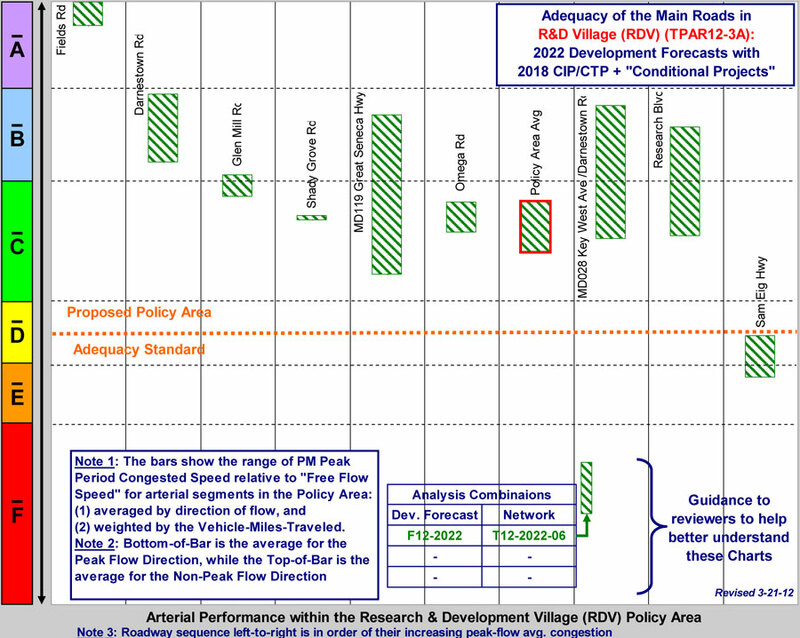 Development that projects a CLV above 1,450 at intersections located within the Research and Development Village policy area will be required to reduce trips or implement intersection improvements. Learn more about LATR and TPAR. Non-Auto Driver Mode Share is the percent of work trips via transit (bus or rail), walking, biking, or carpooling during the peak travel periods of a typical weekday. As of Spring 2015, the current mode share was determined to be 16.1%. The Capital Improvement Program is the tool through which locally funded public facilities, such as sewers, local roads, schools, libraries, and parks can be scheduled and built, in coordination with and guided by, the Annual Growth Policy and Great Seneca Science Corridor. The Growth Policy matches the timing of development with the availability of public services. It ensures that there is enough transportation and school capacity to accommodate new development. The tracking of transportation capacity is covered in 3.0 Traffic Performance and 4.0 Non-Auto Driver Mode Share. The annual component of the Subdivision Staging Policy is a review of the school capacity test. It reports the program capacity for school clusters throughout the county. If a cluster exceeds a 105-percent program capacity ceiling, residential subdivision within that cluster would be subject to a school facilities payment or a moratorium. The Life Science Center contains two school clusters: Gaithersburg Cluster and Thomas S. Wootton Cluster.